BuzzFeed brings us the story of Jessey Eagan, a thoughtful Christian woman who—after "sticking out like a sore thumb" while living and teaching in Amman, Jordan for seven years—has returned to the States and put on a Lenten hijab to "remind herself of [being an outsider], so that I can better love all people, no matter what they look like." She described one interaction she had with a friend in her local area: "Yesterday at church a woman, whom I have known for quite a long time, came up to me and said, 'Jessey, I wanted to let you know that I have been reading your blog and I am so proud of you and what you are doing. Before reading your blog, I never would have even made eye contact with someone wearing hijab. But I was at an event the other day where I saw a Muslim woman and I did make eye contact with her'. "How great is that? Such a small gesture for her to make, and at the same time it was a huge step for her." How great is that? By which I mean: how great is that? 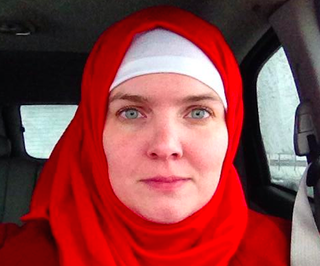 A Christian lady made eye contact with a Muslim lady—as if the two were equals, even. But, if it takes soft, uncomfortable stunt activism from within the inner circle to get Eagan's Christian community to be able to make eye contact with local Muslims, then so be it, I suppose. Eagan seems to be going about this Lenten Hijab Journey with a full heart, if not the clearest of eyes; in her initial blog entry about this project (labeled #40DaysofHijab), she writes about how she wanted to be sure she wasn't being culturally disrespectful. "You are a very thoughtful person full of great ideas…I don't see a reason why people get offended by a very thoughtful, nice, and peaceful act. Our role is teach and educate all people and I'm 100% in support of this idea…My hijab drawer is yours come and pick what u like. If u don't have time I can bring them to u, just let me know what colors." "How great is that?" she asks, again, but rhetorically. It's worth asking outright. I wasn't being sarcastic when I called Eagan thoughtful up top. In her blog, Eagan is genuinely trying to inhabit the different considerations that come when people read you differently than how you normally are: things like her increased smileyness in public, her high-alert attention to potentially prejudicial reactions from people who wear camo or drive big trucks. One thing Eagan says she hopes to do next is use make-up to "darken" her complexion and "go out into the community." "My friend told me that white Muslims and brown Muslims have different experiences, as do black Muslims, within the Islamic community as well as in the community at large," she said. "This is all about helping my people, specifically white Christians, learn how to see difference, embrace it, and engage with it. That's what hospitality does. It welcomes people who were once outsiders into a community with love and the desire to understand." "Helping my people, specifically white Christians." That idea—"helping my people"—is an important tool in clarifying the utility value of the increasingly common and facile stunt pieces that resemble Eagan's project (which is personal and heartfelt, and of a separate kind). I'm a straight man who spent seven days wearing makeup, etc. Black Like Me was 50 years ago. In 2015, if these experiments are useful in increasing political empathy, they are useful only to people who have a troublingly low level of it to begin with. For more on Eagan's project, here's BuzzFeed, or her blog.